The gardening mantra "right plant, right place" applies to soil pH as much as it does to soil type, light levels and other growing conditions. Some plants thrive in acidic soil, which has a pH level lower than 7, while others grow best in alkaline soil, which has a pH level higher than 7. If your garden's soil is alkaline, its pH level can be lowered temporarily with a soil amendment such as sulfur, but growing plants that thrive in the soil's current condition is the more sensible option for a low-maintenance, healthy garden. Many plants grow best in alkaline soil, and they include bedding plants, herbaceous perennials, shrubs and vines. Among the many plants that thrive in alkaline soil are several varieties of annuals and tender perennials -- bedding plants -- available from garden centers and plant nurseries for planting outdoors in spring. 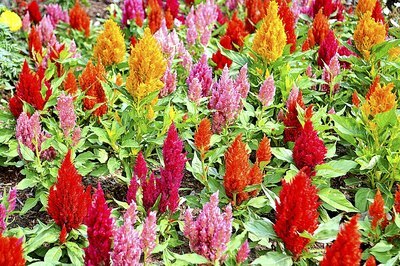 They include snapdragon (Antirrhinum majus) and cockscomb (Celosia argentea var. cristata), both of which grow well in alkaline soil up to pH 7.5. 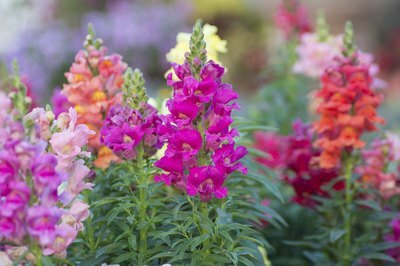 Snapdragon, which is a short-lived tender perennial in U.S. Department of Agriculture plant hardiness zones 7 through 10 and an annual elsewhere, grows 12 to 36 inches tall and 6 to 12 inches wide. Its flowers are shaped like dragons' heads and range in color from white to purple. Cockscomb is a flowering annual that grows 9 to 36 inches tall and 9 to 18 inches wide. It bears orange, purple, red, yellow or pink flowers resembling roosters' combs. A wide range of plants, herbaceous perennials return from the ground every year and include many members that thrive in alkaline soil. 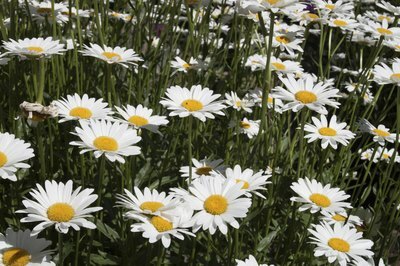 Shasta daisy (Leucanthemum x superbum), for example, tolerates alkaline soil up to pH 8.0 as well as dry soil and even drought. In summer it bears large, daisylike flowers on clumps 2 to 3 feet tall and 1 1/2 to 2 feet wide. It is hardy in USDA zones 5 through 9. Another herbaceous perennial that also tolerates soil up to pH 8.0 is bigroot geranium (Geranium macrorrhizum), hardy in USDA zones 4 through 8. It grows 1 to 1 1/2 feet tall and 1 to 2 feet wide, and features purple-pink blooms from spring through midsummer. Alkaline soil can support many kinds of shrubs, including mock orange (Philadelphus pekinensis) and beauty bush (Kolkwitzia amabilis). Both of them are deciduous and flower on their previous year's wood. 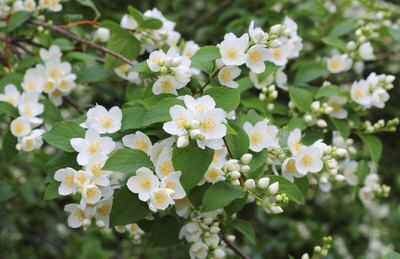 Thriving in soil with a pH up to 8.0, mock orange produces fragrant, white flowers in spring. The compact shrub grows 4 to 6 feet tall and wide, and it is hardy in USDA zones 5 through 8. Beauty bush tolerates soil up to pH 7.5 and is hardy in USDA zones 4 through 8. Growing 6 to 10 feet tall and wide, it bears yellow-throated, pink flowers in spring. Several varieties of vines grow well in alkaline soil. Two vines suitable for soil with a pH up to 8.0 are trumpet honeysuckle (Lonicera sempervirens) and Japanese wisteria "Rosea" (Wisteria floribunda "Rosea"). Both vines are hardy in USDA zones 4 through 9. 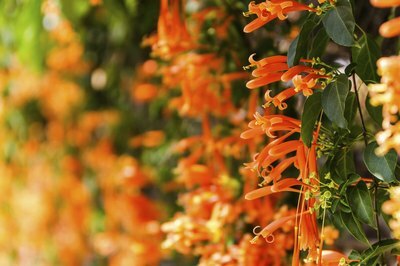 Trumpet honeysuckle grows 8 to 15 feet long and 3 to 6 feet wide, and in late spring it bears trumpet-shaped, scarlet-orange blooms that are yellow inside. The flowers are followed by small, red berries. Trumpet honeysuckle also features blue-green, oval leaves. Japanese wisteria "Rosea" grows 10 to 25 feet long and 4 to 8 feet wide. Its fragrant, pink-tipped, pale-rose flowers appear in late spring on hanging clusters 12 to 18 inches long. Japanese wisteria "Rosea" is invasive in some locations because it grows quickly and its runners root in soil. Keep the plant contained by pruning its branches and runners often. Missouri Botanical Garden: Wisteria Floribunda "Rosea"